With new approaches, open-source software makes data more tangible. 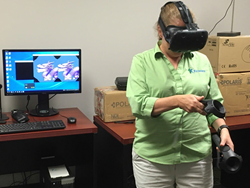 Kitware co-founder Lisa Avila explores data in virtual reality at the company office in Carrboro, North Carolina. With VTK, developers can access ready-to-use algorithms through a convenient application programming interface. Kitware announced that it will introduce two approaches at IEEE Virtual Reality (VR) 2017 that greatly simplify VR application development through the use of the Visualization Toolkit (VTK). The introduction will occur during the presentation of a paper that members of Kitware co-authored with researchers from Indiana University and Idaho National Laboratory. “Previously, application developers took a significant amount of time to create scientific visualization VR applications, as they had to write their own algorithms and data-reading routines,” said Patrick O’Leary, a co-author on the paper and an assistant director of scientific computing at Kitware. “With VTK, developers can access ready-to-use algorithms through a convenient application programming interface. In the paper, “Enhancements to VTK Enabling Scientific Visualization in Immersive Environments,” O’Leary and co-authors describe OpenGL context sharing and VR toolkit embedding. Respectively, these approaches allow developers to use VTK with consumer-level devices such as Oculus Rift and HTC Vive as well as with immersive environments including CAVE™ systems. Kitware officially added VR support to VTK in version 7.1 with the integration of two modules. Along with VTK, the modules equip ParaView with VR functionality. ParaView is an open-source software solution that analyzes large datasets and employs VTK as its rendering engine. Kitware cited the inclusion of VR functionality in ParaView as one of the notable achievements that led to recent recognition. Last month, the company received the Software Innovation award from Albany Business Review, and in November 2016, Kitware accepted an award from HPCwire for Editor’s Choice: Best HPC Visualization Product or Technology on behalf of the ParaView development community. In future efforts, Kitware plans to bring support for portable, threaded data parallel algorithms to VTK. As for ParaView, Kitware intends to release version 5.3 this month. “We aim to continue to extend VTK and ParaView to help developers explore data so that they can more easily make scientific discoveries,” O’Leary said. Two of O’Leary’s co-authors on the IEEE VR 2017 paper, Sankhesh Jhaveri, a senior research and development engineer at Kitware, and William Sherman, a senior technical advisor and team lead at Indiana University, will present their work on VTK and ParaView during the Systems and Applications session at the conference. The session will take place Wednesday, March 22, 2017, from 1:30 to 3 p.m. PST, in Los Angeles, California. For those who seek to leverage VTK and ParaView in VR environments, Kitware offers consulting and support services. Among its services, Kitware creates custom software, tailors its solutions to specific workflows and performs research and development. To learn about Kitware services and to set up a time to meet with Jhaveri at IEEE VR 2017, please contact kitware(at)kitware(dot)com. This material is based upon work supported by the Department of Energy under Award Number DE-SC0010119. This report was prepared as an account of work sponsored by an agency of the United States Government. Neither the United States Government nor any agency thereof, nor any of their employees, makes any warranty, express or implied, or assumes any legal liability or responsibility for the accuracy, completeness, or usefulness of any information, apparatus, product, or process disclosed, or represents that its use would not infringe privately owned rights. Reference herein to any specific commercial product, process, or service by trade name, trademark, manufacturer, or otherwise does not necessarily constitute or imply its endorsement, recommendation, or favoring by the United States Government or any agency thereof. The views and opinions of authors expressed herein do not necessarily state or reflect those of the United States Government or any agency thereof. Kitware is an advanced technology, research, and open-source solutions provider for research facilities, government institutions and corporations worldwide. Founded in 1998, Kitware specializes in research and development in the areas of HPC and visualization, medical imaging, computer vision, data and analytics and quality software process. Among its services, Kitware offers consulting and support for high-quality software solutions. Kitware is headquartered in Clifton Park, NY, with offices in Carrboro, NC; Santa Fe, NM and Lyon, France. More information can be found on https://www.kitware.com.